GALION — On Monday evening, the Galion MOMS group gathered to package approximately 86 boxes to be sent to service men and women who are miles away from home during the holiday season. It’s something that is near and dear to the volunteers who make this happen nearly every month of the year. MOMS — short for Mothers of Military Service men and women — got started by a group of four military service mothers who worked together at Galion City Schools back in 2010. “We decided that the only people who could understand what we were going through at the time were other parents who were in the same situation,” said Nancy Green. Green is one of the teachers who has been involved from the beginning. Gloria Smith got involved around 2011 as soon she found out about the Galion group. Smith and her husband Jerry, both Air Force Veterans, have a son who is serving in the Army. The group has worked hard for the past month collecting donations to be sent to any deployed service men and women from Galion, Crestline and the surrounding area. They have also been given a list by the 179th Airlift Wing in Mansfield that they will be sending packages to for the next couple of months. For Gloria Smith and others, that means sacrificing her personal time and money to make sure the boxes are packed full and sending them goes off without a hitch. Without a doubt, everyone who participates feels the same way. Between packing boxes and signing cards, every volunteer was busy helping on Monday. 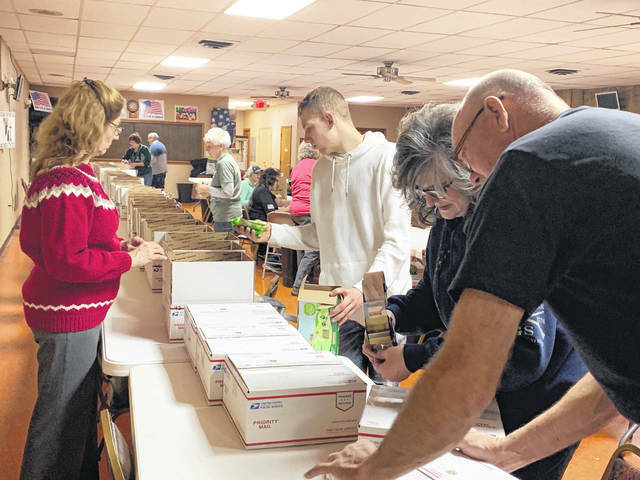 Erin Miller | Galion Inquirer The Galion MOMS group got together Monday night at the American Legion to sort and package 86 boxes to be sent overseas and across the U.S. to members of the military who won’t be home for the holidays. https://www.galioninquirer.com/wp-content/uploads/sites/38/2018/11/web1_MOMS.jpgErin Miller | Galion Inquirer The Galion MOMS group got together Monday night at the American Legion to sort and package 86 boxes to be sent overseas and across the U.S. to members of the military who won’t be home for the holidays.